A young woman was brutally assaulted by an African infiltrator in Tel Aviv. Leftists prevent infiltrators' deportation. A young Jewish woman was brutally assaulted Wednesday evening by an illegal African infiltrator in southern Tel Aviv. She related her experience on her Facebook page. "I don't know how to begin this status, because I never imagined I would undergo an experience like the one I had yesterday,” wrote Bat-El Asher. “The same street where I lived until six months ago, for six years... The same street where I always felt safe, the same path that I still follow every evening when I return from work... will never be the same path again... the feeling of security dissipated at once because of a despicable action by a low-life whose face I will not remember, whom I do not know... but somehow I feel powerful feelings of hatred for him, in every inch of my body. "The hour is 8:30 p.m., the corner of Hamasger Street and La Guardia... I walk toward the bus station and a young man in his 30s, Sudanese, is behind me. Suddenly, the man grabs hold of my arms powerfully, pins me to the wall and delivers several punches to my face, succeeding in dazing me completely. All that for a smartphone... Yes, yes... a smartphone. "I ask myself, why am I so surprised? After all, it is much easier to hit a woman or a weak person, in order to make a financial 'killing' and escape, without bearing the consequences, of course... to beat someone instead of working. “A long time with the police, in a pointless questioning session, then at the emergency ward... going from expert to expert to check the damage to my body... until the pronouncement I had hoped for came from Dr. Shai, an eye expert at Ichilov [Hospital], that thank G-d I had been lucky. The eye is functioning. 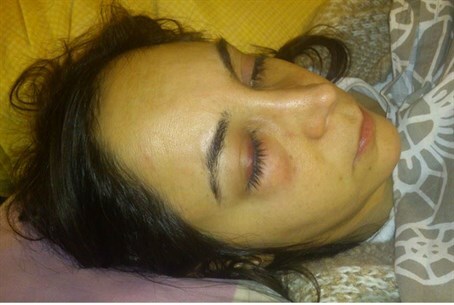 The damage: facial bruises, edemas, swelling and a broken nose. "This is the time to note that I was lucky to be assisted by amazing people... from the squad car that picked me up... the charming guys at Magen David Adom who made sure to visit in the course of the night and check up on me, Dr. Neta from the emergency ward, and the list is a long one... they were all worried, they all cursed and expressed anger... each in his own way. But they all had one thing in common: the fear in the eyes... The fear that the next case will be a relative, a loved one... or the fear that comes from understanding that Tel Aviv's streets are not the safe streets of the past. "After many hours of frustration, while waiting in the emergency room, at long last I was sent to the reception to be released. A young man stood at the reception, a Sudanese, in his 20s... He had also been violently robbed – by another Sudanese. Surprisingly or not, this happened to him on Hamasger street... but he was not as lucky as I was. He was bleeding from every part of his body, he could not remember anything and could not speak. "A woman next to me said – 'I would expect them at least not to behave barbarically to their own people... and I was thinking, sadly, that one should expect nothing from these people. Because until yesterday, I was their staunchest defender... the pain is emotional, more than anything. The point of this status, besides informing people that I am OK, thank G-d, and of course I cannot be reached at because my cellphone currently belongs to the barbarian, is to say that the romantic perception that I lied in until yesterday... that all people deserve an equal chance at a good, stable life... including the refugees... dissipated yesterday at 8:30 p.m. In recent years, leftist NGOs and politicians vigorously defended African infiltrators from deportation and even organized them in protest marches. While Israel's Knesset and media are full of feminists who claim to be champions of women's rights, those same figures have displayed a tendency to hush up any attempt to discuss the atmosphere of terror that the African immigrants have caused in the areas where they live. Numerous protests by residents in southern Tel Aviv have not brought succor to the residents, although the government has built a barrier along Israel's southern border that successfully prevents more immigrants from entering Israel. While the Attorney General said he was shocked by what he saw when he toured southern Tel Aviv, and a Knesset member was attacked on a similar tour, the High Court for Justice recently decided that legislation making it possible to jail the infiltrators was "unconstitutional." In July, five Eritrean men pulled a man out of his car in Tel Aviv and beat him senseless in front of his family. According to the man's wife, the attack was completely unprovoked and was carried out "for fun." The attackers were not drunk, she added, and did not steal anything.